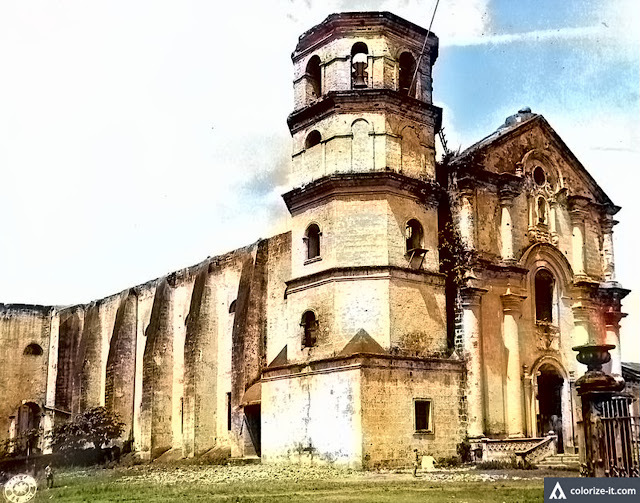 The Lipa Cathedral right after World War II. Image source: United States National Archives. Colorized courtesy of Algorithmia. From an ethnographic paper1 written by one Amparo Reyes, presumably from the then-town of Lipa in Batangas, we get this folkloric story about why the church in the town was built. The paper is part of a collection of similar papers archived at the National Library of the Philippines, amassed by the American anthropologist Henry Otley-Beyer, who was the sole Anthropology professor at the University of the Philippines early during the American colonial era2. The story is just one of several included in the paper, and was entitled “Why the Present Church of Lipa was Built.” From this title, we are able to infer that the church being referred to is what in the present day is called the Lipa Cathedral, the construction of which was begun in 1779 by Padre Ignacio Pallares and completed in 1790 by Padre Miguel Galiana3. The new church was built after the old pueblo erstwhile situated in what is present day the town of Balete had to be abandoned after the cataclysmic 1754 eruption of Taal Volcano. In 1756, inhabitants of the town as a matter of necessity made the decision to move the pueblo farther inland to the present-day location of the poblacion or city center and away from the reaches of the volcano. The remarkable thing about this folkloric tale is that it told of an alleged Marian apparition that led to the building of the church. As most readers will probably know, Lipa was, indeed, the alleged site of Marian apparitions in 1948 when the Blessed Virgin supposedly visited the Carmelite convent in the town. This apparition that led to the building of the church, however, was written down by Reyes in the year 1924; and was likely being told in the town and elsewhere long before that! The folkloric tale is presented in its entirety below, some paragraphs broken into shorter ones for the reader’s convenience, grammar corrected to conform to the standards of this site and annotations provided in brackets [ x ] where necessary. Many, many years ago [a standard opening for folkloric tales; we have already established that the present church was built late in the 18th century], when the present town of Lipa was in its infancy, there lived a couple named Maria and Juan. Maria was industrious, tender-hearted, patient and God-fearing while her husband Juan was lazy, ill-tempered and did not care for his family. He had all kinds of vice that a man could ever have. All he wanted to do while in his house was to eat, scold and kick his wife and his children if he did not find prepared food for him. The poor wife, in order to earn some money, used to go every afternoon to a nearby forest [Lipa was at the time still heavily forested; deer and wild boar roamed in these] and gathered wood which she then sold in the market. In spite of her difficulties and sufferings, she never forgot her devotion to God. One afternoon, while she was going to the place where she used to gather wood, she came to think of her hard life. She wept bitterly, and as she raised her eyes and arms to heaven, she saw a bright ray of light coming from a distance. The woman went back to the town and told the priest about what she had seen. When Maria and the priest went to the place, the Virgin was still there. They both knelt down before the Virgin and prayed solemnly. As they prayed, the light and the image gradually disappeared. The priest and the townspeople agreed to build a church on the place where the Virgin appeared. After several months, the building was completed and that church is at present the magnificent church of the town of Lipa. From that time on, the Virgin’s feast has always been celebrated every year. NOTE: This was commonly believed by the people at home, especially the old folks. Related by my grandmother to me. Manila, August 24. 1 “Folklore from Lipa, Batangas,” online at the National Library of the Philippines Digital Collections. 2 “H. Otley Beyer,” Wikipedia.